Pherrus Financial understands the importance of giving back and supporting communities in need. Our team of dedicated staff and volunteers provide support to children in need, both in Fiji and here at home. 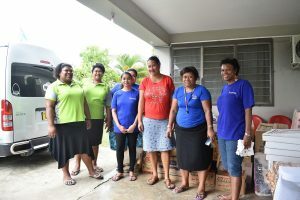 In 2017, thanks to your contributions one of our charitable teams, located in Fiji, was able to deliver Christmas to the Dilkusha Children’s Home. Your support enabled us to bring Santa along with a bus full of presents and plenty of food donations to the 38 children currently residing there. The Pherrus Foundation was also able to send 18 large moving boxes to Fiji to be wrapped by our volunteers there and provided to the children of St Mina’s Hospital in Nadi. Once again Santa hopped on a bus, accompanied by Mrs Claus and the elves to bring presents, donations and food donations to the very excited children, 3 hours away. There were some disappointed faces when Santa had to finally pack up and leave, after distributing toys, food and pizza to plenty of shining faces. Santa said he would speak to the Easter bunny about bringing pizza and chocolate in April. We thank you for your continued support and generous donations of toys, clothing, books and food for the children of Fiji. We will be gearing up soon for the Easter Donation drive in April, and look forward to sharing more stories with you soon about the exciting visits the Easter bunny will be having with all of these wonderful boys and girls. We at the Pherrus Foundation also understand the importance of investing in our local communities. That is why, in September 2017, our staff here in Sydney approached both the Randwick and the Westmead Children’s Hospitals, to understand how we could best support them. Our team asked members of both hospitals for their equipment wish lists. The hospitals both asked for very little in the way of wishes. Westmead requested 2 Medi-fold beds, and Randwick asked for 4 Parent Recliner beds. Providing these beds means enabling concerned parents to stay the night right by the side of their sick child, in the comfort of a bed. We understand the stress and strain that worried parents face in these trying situations and our team was proud to be able to provide them with something that might make their stay at least a little bit more comfortable. The Hardwick beds have now been installed, and are already being put to good use in the hospital’s Burns Ward. We look forward to the installation of the Randwick beds in the near future. We are thankful to both hospitals for allowing us the opportunity to give back to the communities we serve.